How to access IP Camera Recorder from outside of your home network? 1. Make sure that latest version of IP Camera Recorder is running on your Mac and you can control it from your Mac. 3. The IP Camera Recorder is available on your Mac on a TCP port. 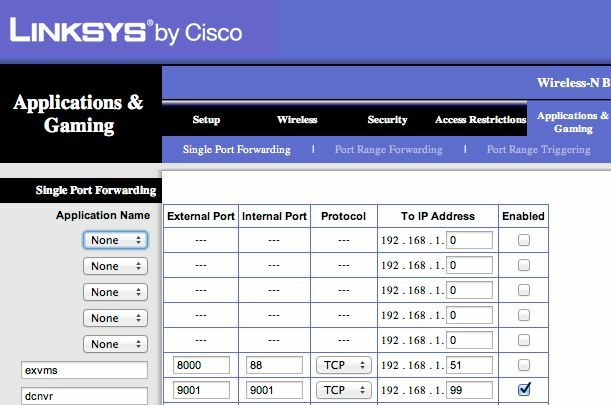 See this Article to configure the port number. Try to connect to it remotelly from the outside computer/iPhone using the external address using Safari. For this enter the external address, followed by port 9002 (for example. Your port could be different) as follows: http://1.1.1.1:9001/ . Where enter the external address instead of 1.1.1.1. See this Article to setup remote access user accounts. In the picture above, the last line forwards the IP Camera Recorder port. Note1: IP Camera Recorder runs on TCP port, so the protocol must be set to TCP. Note2: Set your entry in the column "To IP Address" to the local/internal IP address of your Mac. Save the router configuration and connect to the IP Camera Recorder again.